As founders and directors of Mother of Mercy Messengers, an apostolate of the Marian Fathers, Dave and Joan Maroney have taken the message emanating from the National Shrine of The Divine Mercy in Stockbridge, Massachusetts to parishes, schools, and conferences across the United States and beyond since 1999. In 2012 Dave and Joan launched the Divine Mercy for America Campaign and Network to encourage people to pray for countries as the Lord instructed St. Faustina. Visit divinemercyforamerica.org to sign up and learn more. 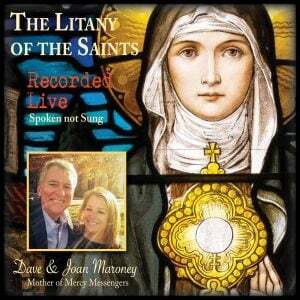 Visit the Audio Page at divinemercyforamerica.org for other great recordings. September 24, 2015, a celebration to commemorate the 80th anniversary of the Chaplet was held at Most Precious Blood Catholic Church in Corpus Christi, Texas. This audio file is the result of the recordings of that evening.